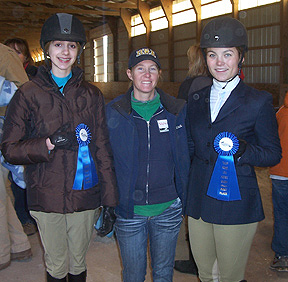 High School Freshman Madison Stephens (on right) won her varsity open over fences while placing second in varsity open flat at Tulip Pond Farm on December 10th to help Greenway at Featherdown win the Upper School competition that day. Greenway coach Mehdi Kazemi (on left) saw has Middle School team also fair well, placing third. Poolesville, MD - Sometimes a delay in writing a story can make for more accurate information. Though it was our intention to post this story five days after it took place an unexpected delay meant that the IEA had time to update their official site with all the Zone 3 team points. This in turn helped us put the results of the December 10th Tulip Pond Farm show in a better perspective. Going into the show we knew that Greenway at Featherdown was very good but now that a few weeks have passed we can tell you that Coach Mehdi Kazemi has the first team in the Zone to reach 50 points this season. The Greenway at Featherdown upper school won at Tulip Pond by a 37-34 margin over Meadowbrook Stables, which when converted into the IEA year-to-date scoring system means they added seven more points to what had been a Zone-leading 43. G at F's upper school team has now earned team points at nine (!) fall shows, having won outright on four occasions while placing second at three others. High school junior Emily Arches of Full Moon Farm (center) poses with her Mother (on right) and Head Coach Karen Fulton after winning the second section of varsity intermediate flat. This would turn out to be Full Moon's only blue ribbon of the day. In spite of not having a full card the Full Moon upper school scored 23 points which converted into fifth place. Full Moon ends the fall second overall to Greenway by a 50-42 margin. . Leading the way for G at F was high school junior Madison Stephens. Stephens was one of four G at F riders to win a class (in her case, the varsity open over fences) and one of four to place second (she was second in varsity open flat very early in the contest). Teammate and high school junior Abby Lauren Margiotta nearly equaled the feat, winning her varsity intermediate flat while later placing third in varsity intermediate over fences. Greenway at Featherdown's upper school earned nine top-two ribbons en route to victory. The high point middle school team was a mild surprise. Rose Mount Farm, coached by recent Virginia Intermont College graduate Mary Ashley Marable, came into the day having scored only four points over three shows. Today Rose Mount earned seven as their riders accounted for 23 point in traditional scoring. Seventh grader Samantha Brown accounted for eleven of them with a first in future intermediate over fences and a third in future intermediate on the flat. This makes Rose Mount one of eight Zone 3 middle school teams which have reached double digits so far in 2011-12. The runner-up middle school team was traditional power Garrison Forest School. Eighth grader Gabi Sorrentino scored ten of the GFS middle school points with a first in future intermediate on the flat and a fourth in future intermediate over fences. GFS finished with 17 middle school points, which raised their overall total from 24 to 29. This puts the GFS middle school at third overall in the zone but first in Zone 3, Region 2. Skye Stansbury (on left) won her varsity open on the flat to start the day. Five classes later Alexis Mozeleski (on right) won her varsity intermediate on the flat to give Meadowbrook Stables another blue ribbon. Head Coach Sue Wentzel (center) would see Meadowbrook score 34 points and claim reserve high point upper school team honors. The Garrison Forest upper school team nearly scored twice as many points as the middle school. However the GFS upper school total of 30 was only good enough for third place. Meadowbrook Stables was reserve champion, earning their second-highest team ribbon so far in 2011-12 (Meadowbrook won at the Foxcroft School on November 13th). High school senior Skye Stansbury won the varsity open on the flat class which started the show while freshman Alexis Mozeleski won her varsity intermediate flat less than an hour later. Another freshman, Maggie Fain, won her varsity intermediate over fences to give Meadowbrook a third blue. By adding five points to their year-to-date total, Meadowbrook finished the day second in the Zone 3, Region 2 upper school standings, trailing only Garrison Forest. The GFS upper school earned more blue ribbons than their reserve-champion middle school. High school junior Katie Bhattacharya won the first of three GFS upper school blue ribbons with a win in junior varsity novice on the flat. By adding four points to their year-to-date total GFS took over sole possession of third place in upper school within Zone 3, leading Pickwick-Clay Hill (which did not compete at today's show) by a 31-27 margin while remaining in first place within in the Zone 3, Region 2 upper school team standings. 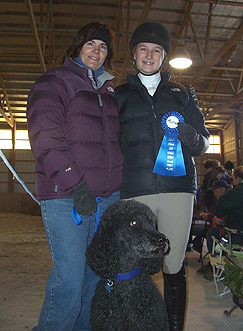 "Boci" the standard poodle was certain that River Farm Equestrian would more than double their year-to-date upper school point total. Makayla Benjamin holds up the blue ribbon she won in junior varsity novice on the flat while Jan Benjamin (on left, who is both Makayla's Mother and the River Farm Coach) saw River Farm score 28 points to earn three for the year and raise their overall total to four. Prior to December 10th River Farm Equestrian had competed in only two shows and earned only one single upper school team point. Today River Farm scored 28 which translated to fourth place and three points to be added to their year-to-date total. High school sophomore Kathryn Maginnis was second to Stansbury in the open flat class which started the day while junior Maggie Pollard won the section of varsity open on the flat which followed. Sophomore Makayla Benjamin (whose Mother Jan coaches the River Farm Team) won her junior varsity novice on the flat a short time later. Maginnis later repeated her red ribbon effort in varsity open over fences while Pollard and Benjamin also jumped their way to second place finishes. The fifth place upper school team for the day was Full Moon Farm. A member for many seasons in the National Capitol Equestrian League (NCEL), this is the first season Full Moon Farm has been a member of the IEA. So far Full Moon has had as good a debut IEA season as anyone Nationwide, having won four of the eight shows they have entered so far. Today Full Moon did not have a full card but still managed 23 points which meant their year-to-date point total rose from 40 to 42. High school junior Emily Arches won her varsity intermediate on the flat for Full Moon's only blue ribbon of the day. Samantha Warnke was one of two Full Moon riders to earn a red ribbon, the high school junior finishing second in varsity intermediate over fences. Full Moon ended calendar year second in the Zone (and coincidentally second in Zone 3, Region 1) to Greenway at Featherdown. Though G at F has a 50-42 upper school lead it should be noted that Full Moon has competed in one less show so far in 2011-12. Placing sixth and adding one point to their year-to-date upper school total was Foxtail Farm. Coach Dana Kiser brought both her Foxtail Farm team and her Hampton Roads Academy team up from the Norfolk, Virginia area to today's event northwest of Washington, DC (well over a three hour drive). Though the end-of-day scoreboard may have shown Foxtail Farm with 20 points they in fact scored 23 but lost the tiebreaker with Full Moon for fifth. Foxtail was extremely effective in junior varsity beginner on the flat, as freshman Jordan Loftis was second in the first section while sophomore Meredith McDuffie won the second section. Zone 3, Region 3 teams are spread out from one side of Central Virginia to the other (this region also includes at least one North Carolina team) and so far only the Chatham Hall School within this region has hosted a show during the 2011-12 season (Chatham Hall hosted two in the fall and will host again in early January). As a result teams in Region 3 have far fewer points so far in 2011-12 than their counterparts in Regions 1 and 2. Foxtail Farm (and Hampton Roads Academy) are among the easternmost Region 3 teams and were the only members of their region to compete at today's show. Foxtail doubled their point total from one to two with the green ribbon but may become a factor if they compete more often in early 2012 Region 3 events. For a little over half an hour the stars lined up very well for Foxtail Farm. 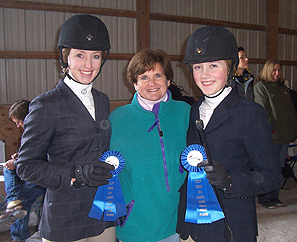 Head Coach Dana Kiser stands between seventh grader Katie Balding (on left, who won future novice on the flat) and high school sophomore Meredith McDuffie (who won junior varsity beginner on the flat). In between Jordan Loftis (not pictured) was second in junior varsity beginner on the flat. One of two Region 3 teams entered at the Region 2 area event, Foxtail's middle school was was fifth while their upper school was sixth for the day. Four of the top six upper school teams coincidentally made the top six for middle school. Third place Greenway at Featherdown scored 14 middle school points to raise their year-to-date total from 32 to 36, also the top total in Zone 3 for the year so far. Shortly before Loftis and McDuffie came through for the Foxtail upper school team seventh grader Katie Balding won her future novice on the flat to help them reach ten middle school points and fifth place for the day (Foxtail now has six middle school points). Placing fourth in the middle school competition was Sunny's Corner (or 'Sunny's Corner Foundation' as they are properly known). Victoria Reid won the future novice over crossrails class which concluded the day's events. Reid's blue ribbon raised Sunny's Corner's total from four to eleven points. 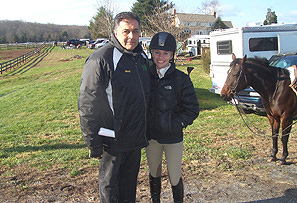 On the year-to-date scoreboard Reid helped her team earn their first three IEA team points ever! Willowbend entered the day with 12 year-to-date middle school points and left Tulip Pond Farm with 13. One of eight middle school teams entered, Willowbend scored seven points for sixth place. Strangely enough Meadowbrook and Full Moon both scored three middle school points to miss out on adding year-to-date points though the latter remained at 30 overall which puts them second to only Greenway at Featherdown exactly like in the upper school team race. Though nine of the 15 upper school teams present at today's event did not earn year-to-date points many of their individuals faired well. High school senior Mary Webb Banning of Hampton Roads Academy won her varsity intermediate over fences while placing second in varsity intermediate on the flat. Hampton Roads Academy was technically seventh, scoring 17 points. The Garrison Community Team earned three blue ribbons, as many as the GFS school and Meadowbrook (both Garrison teams train on the campus of the Garrison Forest School; the GFS team is made up of students at the school while those who attend other schools near the GFS campus compete for the community team - Editor). Among the GCT winners were freshmen Catie Wegner (in junior varsity beginner on the flat) and Sarah Walters (in junior varsity novice over fences; also known as novice over crossrails). The Garrison Community Team earned 16 points. Potomac Valley, which is the northernmost team in Zone 3 (close to the Pennsylvania border; Ironically today's show was less than three miles from the Potomac river separating Maryland and Virginia) scored 15 points without any rider placing higher than third. And host Tulip Pond Farm earned five of their seven points in the third-to-last class of the day. Junior Alana Hamann finished second in junior varsity novice over crossrails for the home team. 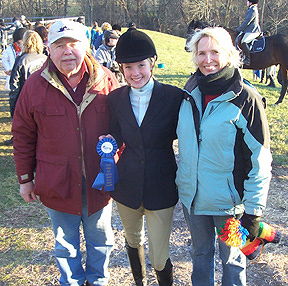 It was her first IEA blue ribbon and she earned it with both her Mother and Grandfather present. 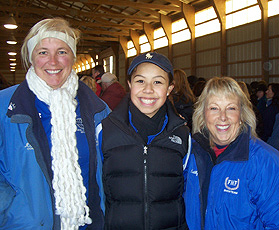 Sarah Walters of the Garrison Community Team (center) was a winner in junior varsity novice over fences. Though the GCT did not finish among the top six teams for the day three of their riders were blue ribbon winners. Time is of the essence: There were 13 flat classes (ten for upper school riders) and 10 over fences classes (eight for upper school). The flat classes were held first in the indoor ring while the jumping classes were held outdoors in the afternoon. With no more than ten riders in any of the 23 classes it would seem like the show would be over well ahead of sunset (at roughly 5:00PM Eastern Time) but this was not the case. The first class started at 8:39AM (only a few minutes later than the projected 8:30AM kickoff) and when the final flat class was placed at 11:42AM things still appeared to be on schedule. But when the jumping started up at 12:50PM things began to move at a slower pace than hoped. As the over fences classes progressed Kazemi and Jenny Mitchell (who coaches the Garrison Teams) were quite rightly very vocal in getting riders to mount up and realize that there is only so much daylight remaining. The last class was placed at 4:53PM, with the sun mostly having set on a clear but cold afternoon. Though four of the ten jumping classes were made up of only seven riders it still took an average of 24 minutes to complete an over fences class on this day. What's ahead? : Because teams routinely cross regional boundries to compete within Zone 3 the next show for one team might not be the next for another. The Pickwick-Clay Hill team from Region 1 which did not compete today (but remains among the Zone 3 leaders) will host shows on January 7th and 8th. The Stone Bridge Farm and Clover Grove IEA teams will co-host on January 14th (these will be the first Zone 3, Region 3 shows not at Chatham Hall this season, instead taking place at Stone Bridge Farm) while the Madeira School will host on January 15th. Madeira, whose upper school scored ten points at Tulip Pond, will open their doors to Zone 3, Region 2 riders only. In addition this show will be limited to Upper School riders only. From there the schedule really gets busy, with all three regions holding shows on January 22nd (day two of back-to-backs at Chatham Hall in Region 3, the Garrison Community Team and Meadowbrook co-hosting at GFS in Region 2 and Greenway at Featherdown hosting in Region 1). With several of the late January shows limited to only a specific region there is no doubt that some (but not all) will be shorter than today's event and that some teams which are not currently very high in the overall standings will rise significantly. Show Incidentals: Sunny skies but chilly, with temperatures reaching the upper '40's. Start Time: 8:39AM. Finish: 4:53PM - includes 68 minute lunch/schooling break. Judge: Nancy Ashway, Easton, MD. Stewards: Julie Wright/Greenway at Featherdown, Kina Davis/Potomic Valley Equestrian and Dana Kiser/Hampton Roads Academy and Foxtail Farm. Team Totals - Upper School: Greenway at Featherdown (High Point Team) 37 (7); Meadowbrook Stables (Reserve) 34 (5); Garrison Forest School 30 (4); River Farm Equestrian 28 (3); Full Moon Farm 23 (2); Foxtail Farm 20 (1); Hampton Roads Academy 17; Garrison Community Team 16; Potomac Valley 15; Madeira School 10; Tulip Pond Farm 7; Rose Mount Farm 7; Sunny's Corner 5; St. Timothy's School 5 and Willowbend 4. Team Totals - Middle School: Rose Mount Farm (High Point Team) 23 (7); Garrison Forest School (Reserve) 17 (5); Greenway at Featherdown 14 (4); Sunny's Corner 11 (3); Foxtail Farm 10 (2); Willowbend 7 (1); Meadowbrook Stables 3 and Full Moon Farm 3.